I write science fiction and fantasy, sometimes on the streets of my native Northern Ireland, sometimes in my Space Opera world of Abendau. I’ve been writing for five years, and have three books released to date with two more under contract. I also have a lot of short stories published, many of which can be accessed free from my website. 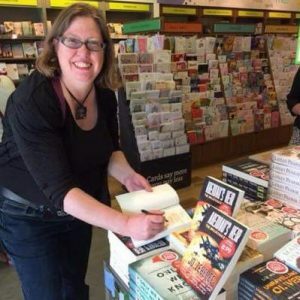 I also run my own consultancy, have kids, pets and general chaos all around me – which means I can write in any amount of chaos! The year I turned 40, I started to worry I was running out of time to tell the story I’d wanted to since I was 16. I sat down to write it and haven’t stopped yet. I’m inspired by the characters in my stories, and making them come to life. I love the process of crafting a story, and enjoy seeing where the raw idea will take me. I’m completely from the seat of my pants, for the first draft anyway. After I have a sense of the story, I edit and hone and move scenes around, adding or deleting for impact. My characters build as I write, and I often find myself deep into their mindset when I’m in their point of view. For that reason, I don’t need character sketches – I just need to know them. I don’t need to – once I start writing, I start to think like them. Sometimes, though, I’ll try to experience the world as them – I think that makes them into more rounded characters. Firstly, write. Write lots, and because you enjoy it. Secondly, once it’s of a good standard – get your stuff out there. It’s a really hard business, start to grow your fan base. Ha! My writing career has been like the gods throwing dice in a Terry Pratchett book…. I wanted to go the traditional route, get an agent, and then a publisher and, at first, it looked like I was going to. I got an agent for my second book, Inish Carraig, and we set about honing it. In the meantime, my first book – the first of a completed trilogy – had no home and I was worried about losing it. When I received an offer on the trilogy from a small publisher I went with it. Sadly, Inish Carraig hit the market at a very challenging time, and it sat between the young adult and adult market a little too much to be an easy fit, and it didn’t sell. It came back to me. I knew people liked the idea very much (aliens vs Belfast, in a nutshell), and my beta readers had loved the book – as had the agent. I decided, rather than lose it, I’d self-publish. Which means I’m one of the trendy hybrid authors who publishes both traditionally and self. I really like this – it gives me freedom to write the projects I want to, knowing if they can’t find a home (my stuff is often a little hard to place) I can make my own home for it. I think it’s really challenging to be a writer – there are so many voices, so many avenues and so much competition. Long term, I think there will still be the ebook market, but sooner or later that market will diversify so there is more competition, and the trade market because some people (like me!) will always prefer the hard copy over the e-version. What genres do you write? : Science fiction (mostly Space Opera), fantasy, and a little bit of horro. A very interesting interview, Jo. I really enjoyed getting a little understanding of where you are coming from as a writer. I’ve enjoyed two of your books, so far – must get the third one. Keep up the good work!